Warmley Wheelers, based at the old railway station in Warmley on the Bristol to Bath cycle path, is a new project offering wheelchair-adapted bikes for use by people with disabilities. It was launched on 2 April at an event attended by Councillor Ian Boulton, Chair of South Gloucestershire Council, representatives of Warmley Park School, Sustrans and Milestones Trust, whose day opportunities group for people with learning disabilities will be helping to run the scheme. “The Bristol and Bath railway path is a really valuable asset in South Glos, and to enable everyone to use it is really important,” says Councillor Boulton. The bikes will initially be used by Warmley Park School, and by Milestones Trust, but it is hoped that in a few months they will be available for hire to the general public. Funding for the project came from the Department of Transport’s Local Sustainable Travel Fund for Communities. The Communities fund is administered in South Gloucestershire through Travelwest in partnership with Sustrans. Milestones Trust wrote the bid jointly with Liz Gray, whose son uses the service and who has been a strong advocate of the project. “Once we are completely set up, it will be open to everyone,” says Christine. South Gloucestershire Council agreed to develop the land and the station platform at Warmley Railway Station as a place where people can use adapted bikes. This work is now complete. The location is perfect, as it is right on the Bristol to Bath cycle path, and has a café adjacent. “We can also use the signal box as an area for group activities,” says Christine. “It’s perfect for the guys as it gives them employment, social inclusion and exercise!” Several adapted bicycles have been bought and are stored at the centre, each with its own name such as ‘Cary Grant’. Other groups have helped to develop the Warmley Wheelers, including Warmley Park School, whose children designed the logo. This project builds on the reputation already gained by Milestones Trust for promoting independence through cycling at their existing weekly cycling club in St Pauls, set up earlier this year. People with learning disabilities, mental health needs and other disabilities join this group every Friday to use accessible bikes and grow their cycling skills. 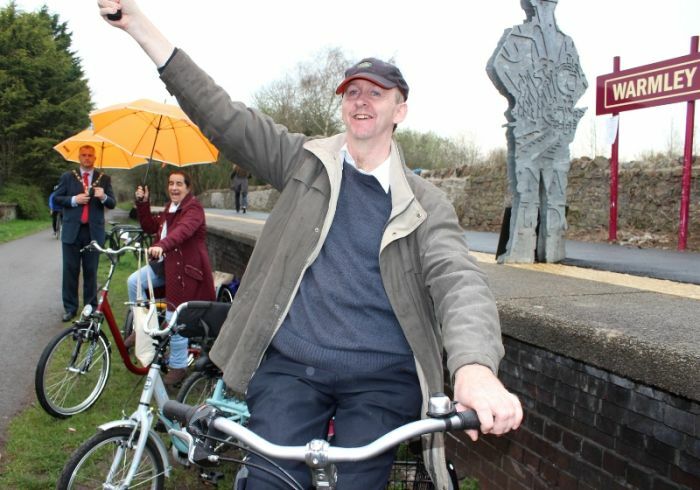 Bristol leads the UK in cycling, and Milestones Trust is working with other groups and council schemes to ensure disabled people are not left behind. Be the first to comment on "Warmley Wheelers makes cycling more accessible"